With a Fresh Air Exhaust (FAE).... now your Fumes get transferred down into the Prop wash where they are safely pushed away from the boat and past the wakesurfer. On Some boats, the Sound db is cut in half. So you also get a more enjoyable ride. No major Modifications needed to install the Fresh Air Exhaust. System can be removed at any time. What does Fresh Air Exhaust (FAE) do for your boat? Easy to install. No holes drilled into boat. E-Mail or Call (704-799-2192) for More Details and Pricing. Do I have to remove FAE to wakeboard? No. Once you install it, you can forget it. You will want to check occasionally to confirm that all mountings are tight, but other than that, you can ignore it. Does FAE interfere with my wakeboard or surf wake? No. At wakeboard speeds you will see a small spray of water coming from the back of the boat. It is small and has no impact upon the shape of the wake. Do I have to modify my existing exhaust system to mount FAE? There is no modification of your exhaust system required except to remove the flapper and replace it with FAE components. The original flapper is easily replaced if FAE is later removed. Do I have to drill holes in my boat to mount FAE? Depending upon your boat, you may have the option of mounting to the swim platform or to the back of your boat (transom). Boat transoms are designed to have hardware mounted to them. Use a silicone adhesive to prevent any leakage. Does FAE interfere with engine performance? In all of the boats we have tested, we have measured only slight degradation in engine performance (2.5%) at wide-open throttle. You will not be aware of this degradation unless you time your boat with a stopwatch. Our testing shows that fuel consumption remains unchanged with FAE installed which indicates that engine performance is unchanged. We also check engine temperature and exhaust backpressure. With FAE, the boat goes from 2 exhaust outlets down to 1 outlet that is underwater. Why doesn't that reduce engine performance? 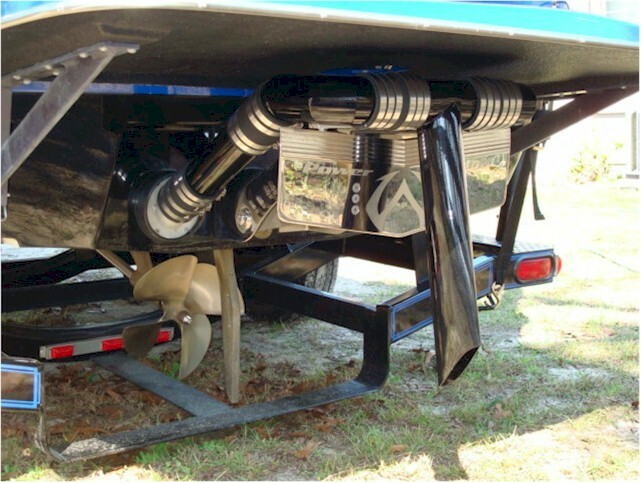 Boat exhaust systems are typically larger than necessary. Compare the diameter of a boat's exhaust pipes to a car with a comparable V8 engine. The car's tail pipe is typically about 2.5 to 2.75 inches in diameter, and there is just one of them. Most boat tail pipes are 3 inches in diameter and there are two of them. In addition, exhaust gasses flow more efficiently if they are swirling as opposed to going straight. We surmise that FAE causes the exhaust gasses to swirl when they go through the first 90-degree bend and again when the gasses meet at the tee. As the exhaust exits the pipe into the water, the water may also be sucking the exhaust out of the system as well. We continue to research FAE so that we fully understand why it works so well; but that is the important thing: that it works so well. What does FAE do to exhaust backpressure? On the boats we have tested, FAE increased backpressure slightly or decreased backpressure slightly at all normal operating speeds. At wide-open throttle (WOT), backpressure increases approximately 1 psi bringing the total backpressure to just less than 3 psi. Again, this only occurs at WOT. If you back off the throttle by 100-200 rpm, the backpressure drops below 2 psi. Except: One boat we tested went to 3.5 psi at WOT with the factory exhaust and 5.5 psi at WOT with FAE installed. However, at all other engine speeds this particular boat had a reduced backpressure with FAE installed. Does FAE interfere with boat handling? Can I still do roundabouts? Maybe. A roundabout is an extremely rapid turn that inboard boats are capable of; most people never do them. FAE are designed to slip loose if you should strike an obstruction but stay in place in all other normal operating conditions. We design the mounting brackets to allow FAE to swing away if something is struck; consequently, due to the "violent" nature of a roundabout, FAE may come loose. If you do roundabouts, additional hardware can be added to enhance the "holding power" of FAE. Can I still trailer my boat with FAE installed? If the FAE becomes loose, is it difficult to re-attach? No. If the boat is on a trailer, you can re-position and tighten FAE with a screwdriver in a couple of minutes. My boat has "Ultra Low Emissions". Is there still a risk of CO poisoning? The Ultra Low Emissions standards do NOT cover Carbon Monoxide. So far, we have only conducted a brief test of CO concentrations behind an Ultra Low Emissions rated boat and the CO concentrations appeared to be as high as any other inboard boat that we've tested. If you have an Ultra Low Emissions boat, do not be lulled into a false sense of security; your engine still produces lethal levels of CO.
What is covered under the FAE a lifetime warranty? The lifetime warranty covers the materials and workmanship from defects. The warranty excludes any rubber grommets or sleeves and the finish (paint). Impact damage would also void the warranty. FAE are constructed from 16-gauge type 304 stainless steel; they are tough. If you were to strike a log floating on the water, there will probably be no damage to the FAE. A rock strike may damage the FAE. Will FAE interfere with my boat warranty? No boat manufacturer has stated a warranty issue with FAE. Calabria, the first boat manufacturer to receive certification from Mercruiser, has shipped FAE installed on their boat. If concerned, have your boat dealer perform the installation. Is installation easy; how do I install FAE? We suggest you allow at least 2 hours for the install.